The Lake District National Park in the beautiful county of Cumbria is one of the best tourist and holiday destinations in England. Now named as a World Heritage Site in 2016, this area of great natural beauty offers an enormous range of attractions, both natural and man-made. Loweswater in Western Lake District. With breathtaking mountain scenery, sixteen sparkling lakes, countless attractive villages and hamlets, and its abundance of wildlife, the Lake District’s unsurpassed landscape has inspired the artistic works of many including Wordsworth, Wainwright and Beatrix Potter. William Wordsworth declared that the Lake District was ‘the loveliest spot that man has ever known’ and John Constable described the Lakes as ‘the finest scenery that ever was’. Come and stay in one of our exclusive Lake District Cottages for couples, with easy access to the stunning and more peaceful Western Lake District. 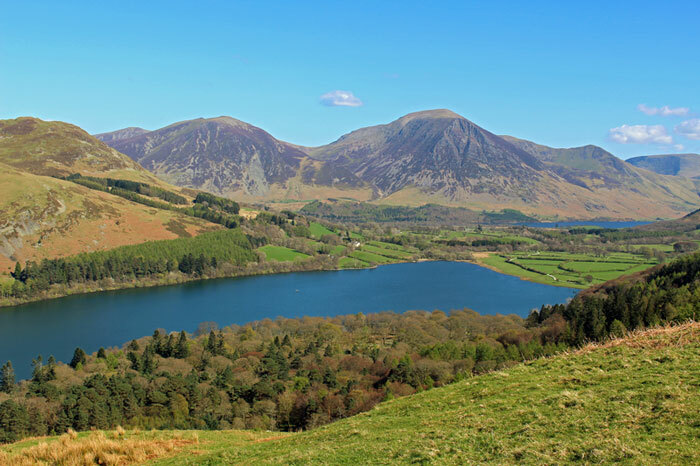 Ellen Hall is within easy reach of Buttermere, Crummock Water, Loweswater and Ennerdale and all these lakes provide easy, beautiful walks along their shores. If your feeling that bit more adventurous and want to tick off some North and Western Wainwrights, then Skiddaw, Grasmoor, High Stile, Haystacks and Great Gable are among the finest days walking nearby. Our Lake District cottages cater for all tastes and budgets. You will find luxury, great value and a truly memorable break at Cottages Made For Two. Book a romantic break for two online today! Stunning views and some of England’s finest scenery provide a backdrop to the wide choice of attractions and things to do in the Lake District. Take a trip to Cumbria and indulge yourself in quality food and drink from cosy Lake District pubs and inns to more formal restaurants. For the more adventurous there are plenty of outdoor activities on offer from walking and cycling, to rock climbing and abseiling. If you prefer an amble around the shops and art galleries there is plenty to keep you entertained, with art exhibitions on throughout the year. With so many things to do, all year round, you’ll never be stuck for ideas or inspiration to make your stay in Cumbria a memorable one. You are very welcome to ask us before or during stay for some of our recommendations. England’s largest National Park includes Scafell Pike – its highest mountain, Wastwater – its deepest lake and thriving communities like Keswick, Cockermouth, Ambleside and Bowness-on-Windermere. Carlisle and Hadrians Wall are a short drive too, infact there is so much to see and do; we know you will want to return, like so many do. On the website below you’ll find information for visitors and students about this unique corner of England. You are of course very welcome to tap us for information during your stay at Cottages Made For Two. We just love to recommend stunning spots to visit and mouth-watering places to eat and drink.